A 15-year ''labour of love'' is going viral for a pair of bush-walking cribbies from Papatowai, thanks to the power of the internet. 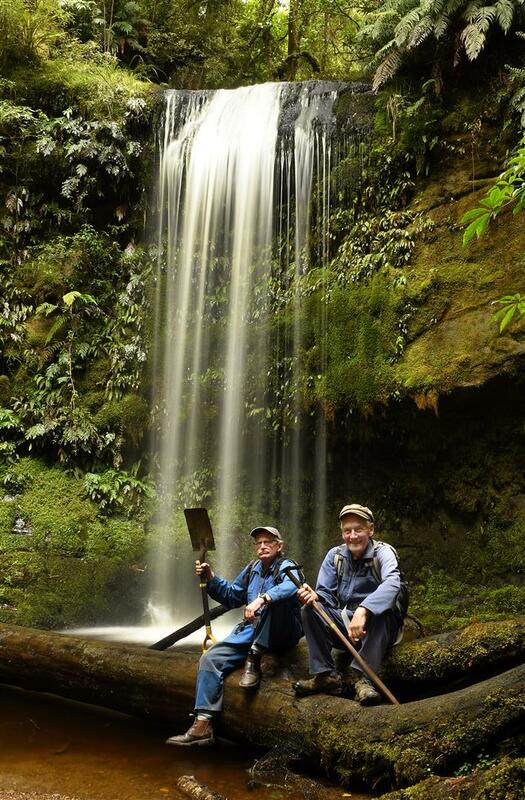 Local man Wayne Allen's interest was piqued when he discovered the Catlins had several ''forgotten'' waterfalls among its total of 140, alongside tourist drawcards such as Purakaunui and McLean Falls. ''I set out with Peter [Hill] to see what we could see, just with a view to exploring initially. Further research revealed the so-called Koropuku Falls trail was once under the Department of Conservation's purview and the route passed through conservation land. ''I checked in with Doc and found it was also recorded as a historic paper road. That early ambition turned into a 15-year ''spare-time'' project which included building a winding path of more than 2000 punga logs. The 40-minute return trail had been accessible for ''two or three'' years, but Mr Allen said recent promotion on camping apps had allowed a growing ''league of nations'' to enjoy it. One couple had even left a ''love note'' to the trail, now pinned to the entry sign on the Chaslands Highway, although others had, unintentionally, been less complimentary. ''Someone online thanked the 'two old men' who built the trail,'' 71-year-old Mr Allen said.